24 n Performance & Hotrod Business n March 2015 M ost business owners agree that the reason for attending a trade show is to meet suppliers and sales reps face-to-face, to examine new products, take advantage of educational opportunities and to meet and trade notes with other business owners and peers. THE SHOP SHOW is expected to provide all that, plus a reliable preview of what's to come in 2015—a preview unique to the perspective of shop owners in the automotive aftermarket and therefore with a focus on their unique needs. The combined automotive aftermarket represented at the show will include ele- ments of the performance, racing, hot rod, classic car restoration, restyling and truck accessories markets. Four featured sponsors will anchor the show: Vibrant Performance, Hammerhead Armor, B&W Trailer Hitches and Meyer/VSI—representing a cross-section of the energy and the technology that is currently driving the automotive aftermarket. Industry insiders predict overall positive growth ahead in the automotive aftermarket. "We're incredibly optimistic," says Albert Reda, Director of Sales & Marketing, Vibrant Performance. He believes there is plenty to get excited about because although it took a few years for some people to get back into a growth scenario, "with the introduc- tion of the EcoBoost turbocharged platform in a Mustang, we're optimistic about the market and feel growth will be driven by people's involvement, understanding and use of turbocharging in performance applications." Nick Gramelspacher, VP of Sales & Marketing for Meyer Distributing, is equally confident in the market, saying he expects another great year of growth in 2015. He predicts that lighting and Jeep products are at least two areas that will see significant growth in the coming year. Expect to see plenty of new Jeep Wrangler parts at the show, Gramelspacher says. Education & Training While browsing the show is educational in itself, a compre- hensive curriculum is planned that will be available free to show attendees. For example, Vibrant Performance is planning to lead a seminar on fabrication techniques—both introductory and touch- ing on advanced how-to topics. 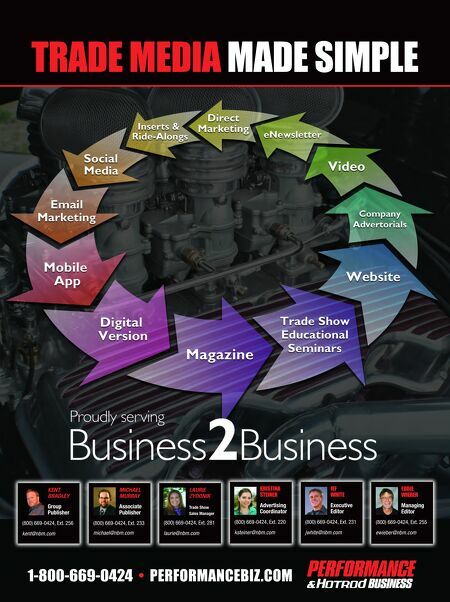 Other topics—essential to the successful operation of any shop in any sector of the automotive business—include: • Engine Tuning • Coolant Technology • Weatherstripping • Hot Rod Industry Panel • Marketing for your Shop • Dealership-Driven Revenue • Paint Spraying • Chrome Wheel (PVD) Basics Also planned are informative sessions on running the business, including seminars on online marketing, social media and public relations. For those seeking informal conversation, a roundtable discussion on common shop challenges and solutions rounds out the education program. Attendees may take as many classes as they like, all included with registration. For those who prefer shorter training sessions, "Training in the Hall" is a program in which exhibitors will present 15-20-minute in-booth sessions. Evans Cooling Systems, Hammerhead Armor, Lund International, and North Light Color / HEXIS are a few of the exhibitors offering in-booth classes. 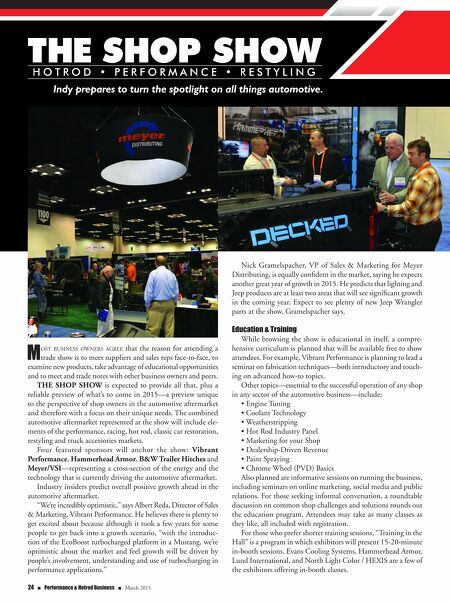 Indy prepares to turn the spotlight on all things automotive.